In 2016, a social marketing expert and a public health specialist joined forces to tackle a problem facing health authorities in Ireland. As in many countries across Europe, Ireland was seeing very low influenza vaccination rates among health workers and annual outbreaks of influenza in health-care settings. Dr Christine Domegan, Senior Lecturer at the National University of Ireland, Galway, brought the marketing know-how to the duo, while Dr Aine McNamara, Consultant in Public Health Medicine for the Health Service Executive for the west of Ireland, provided the public health expertise. They were tasked with devising an intervention to increase vaccination rates among health-care workers, in line with the strategic priorities of the government-led initiative Healthy Ireland as well as national and WHO vaccine recommendations. The results speak for themselves: vaccination rates in the first year were down to 15% on average; in 2 years, they had doubled to more than 37%. The starting point for the project was WHO’s TIP FLU, an influenza-specific version of the TIP (Tailoring Immunization Programmes) approach that was launched in 2013. TIP is a process that uses social and behavioural insights to identify barriers and motivators related to vaccination. These insights are then augmented with systems thinking and causal loop mapping to design multilevel solutions to increase vaccination uptake. The project began with a literature review and survey of attitudes, including dissenting voices – people who actively speak against immunization. The second phase involved examining causes, effects and the dynamics of perceptions of immunization. The team produced a multi-causal influenza vaccination system map to show these interactions. The final stage included stakeholder interviews that identified solutions and leverage points. Peer vaccinators can also be influenza vaccination champions, but a range of champions can be recruited from different categories of staff within the hospital system, as well as outside of it, to serve as ambassadors for vaccination. According to Dr Domegan, certain people who found the moral arguments objectionable responded better to arguments that focused on vaccination as a mutual benefit to their family and their own immune system. The project also illustrated the importance of tailoring the approach to the context of the ward and unit, as well as to the size of the institution. The answer was to use the mechanisms that worked best in any given context. For example, one hospital identified the entrance to the stairwell and lifts as the key physical space for the promotion of vaccination, while other hospitals used corridor skirting boards as a novel way to catch peoples’ attention with literacy messages encouraging vaccination. Influenza framing, or how people talk about the disease and vaccine, was the final piece in the puzzle. 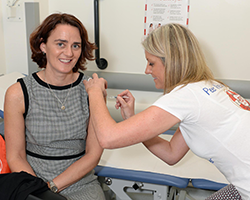 Taking inspiration from a study in the United States of America that framed the influenza vaccine as the “ultimate immune system boost”, Dr Domegan and her team recommended influenza vaccination champions who embodied health and fitness. Terminology is another important aspect of framing. “There are times when people trivialize the ‘flu’, so there are times when you need to use the word influenza to frame and underline the seriousness of it,” explains Dr Domegan. Using the insights provided by the project, Dr Domegan and Dr McNamara guided hospitals to introduce targeted changes that helped boost average immunization rates from 15% to 25% in the first year. This was followed by a jump to 37% in the 2017–2018 influenza season. The project won an award at the European Social Marketing Conference, and continues in the west of Ireland.